Let’s not blame jailbreaking for the constant app crashes on your iPhone or iPad. In fact, we barely find any applications that are incompatible with a jailbroken device. When an app on your iOS device crashes, most likely because something is wrong with it. If you do enough research, you will know that even regular iPhone, iPod touch, and iPad (non-jailbroken) frequently have app crashing problems as well. As someone who owns an iPhone with Cydia installed, I’ve found that some of the third-party apps (from the App Store) doesn’t seem to work very well. Some of these include YouTube, Safari, and even a jailbreak tweak called BytaFont 3. If any of these applications ever crashes when being opened, you can try some of the tips below. What if it’s not the SafariCrash bug? It looks like the new YouTube update (v11.34) now has jailbreak detection. I totally forgot that I still have Auto Update enabled for the App Store. As a result, the YouTube app on my iPhone was updated to the latest version last night. Early this morning, I tried several attempts to open the app. Unfortunately, just like the rest of them (with jailbreak detection) YouTube crashes upon opening. If you are a jailbroken user, there are a few ways to fix this issue. The first option is to downgrade YouTube back to its previous version. This will guarantee that it won’t crash again. You can go ahead and check out this guide on how to use AppAdmin, a jailbreak tweak that adds downgrading option to App Store apps. YouTube should return to its normal stage after that. Go to Cydia and install either YouTube ++ or Cercube 3. At least one of them will work with the latest YouTube version. Furthermore, they also give you extra features like native background audio, disable ads, and more. We have a comparison post here. Sometimes, the YouTube tweaks we mentioned above might not work or still incompatible with the newest update. This will eventually create more headache for you. In the meantime, downgrade back to YouTube v11.33 or lower will resolve the crashing problem. It’s safe to assume that PayPal’s priority is to ensure that its products are secured for users to use. Be it the web-based dashboard or the mobile app on your iPhone. Some people have reported that after getting the latest update for the PayPal app for iOS, the application keeps on crashing upon launch. If this is happening on your jailbroken device, there are several dedicated tweaks such as PalFix to help you fix this issue. We already talk about it in this article. The other day my friend texted me to grab the Confirmed app by Adidas from the App Store so we can increase our chance of getting a pair of Yeezy. Unfortunately, that didn’t work out as expected. It looks like Adidas has implemented jailbreak detection on their Confirmed app. But don’t worry because we’ve found a solution for that here. While the regular Uber app doesn’t forbidden jailbroken users from using it, the Uber Driver app does. This one was designed specifically for drivers who work with Uber to earn money. Therefore, it’s important to prevent them from spoofing their location. If you don’t take advantage of such thing, there is a tweak to help you solve that issue without restoring your iPhone. Check it out from this post. Unlike the other apps we’ve mentioned, Snapchat doesn’t crash when being used on a jailbroken device. Instead, it will prevent users from login into the app. When you try to sign in, Snapchat will either display some sort of error code (related to connection or network) or says that you’ve been banned for using third-party apps. This is an on-going battle between iOS users and Snapchat. But if you use the right tweak, it will help you bypass that restriction. To learn more about it, see this comprehensive review. What’s your favorite browser? Mine is the stock Safari app. Most of us use this browser on a daily basis. There are multiple fixes to this problem. As for the first one, a developer from r/Jailbreak Reddit recently released a new jailbreak tweak called StopCrashingSafari that help you prevents the CrashSafari website from loading. Once you get the tweak to installed on your iPhone, launch Safari, and go to CrashSafari.com. Noticed now the entire page doesn’t even load. Specifically, it will say “Safari cannot open the page because it could not connect to the server.” This is a pretty cool tweak isn’t it. Now you can rest ensure that your iPhone’s Safari browser doesn’t crash every time someone try to pull a prank on you. Good question, if that’s the case you can try the following solutions. Sometimes your iPhone or iPad isn’t running on the latest firmware. You can go to the Software Update section to perform the upgrade. Touch ID makes unlocking an iOS device easier. Users no longer have to enter their passcode manually (this has many benefits). Furthermore, authorizing a purchase or download from the App Store is much easier, too. It can also be applied to applications like PayPal, LastPass, Amazon, and much more. A lot of folks use the fingerprint reader to quickly login into these apps. Last but not least, Touch ID is extremely useful when buying things with Apple Pay. There is no sign of this feature wouldn’t play nice on jailbroken iPhone or iPad. But recently, a few people have reported that Touch ID stopped working after each respring. For those aren’t familiar with this term, it basically means restarting the device’s Springboard. You usually do this when installing a tweak, switching themes, or making changes to your iPhone. If Touch ID isn’t working on your iPhone or iPad, there is a new jailbreak tweak called Touch ID Respring Fix that does exactly what its title suggested. The bug that prevents Touch ID from functioning immediately after a respring will be removed after you install this tweak. There is no option to configure. iPhone 5s or later, iPad Pro, iPad Air 2, or iPad mini 3 or later. After jailbreaking my iOS 9.3.3, I quickly install BytaFont 3 because I’m tired of seeing Apple’s default font on my iPhone. For those who don’t know this package, it adds custom fonts to your jailbroken iPhone or iPad. If you are not happy with the current font system on your iOS 9, this tweak will allow you to customize it. Recently, someone from the r/Jailbreak brought up a discussion that BytaFont 3 is putting his device in boot loop. More specifically, if you get the latest version, you’re guaranteed to see it. This isn’t the first time that a user reported this issue. It was posted multiple times. 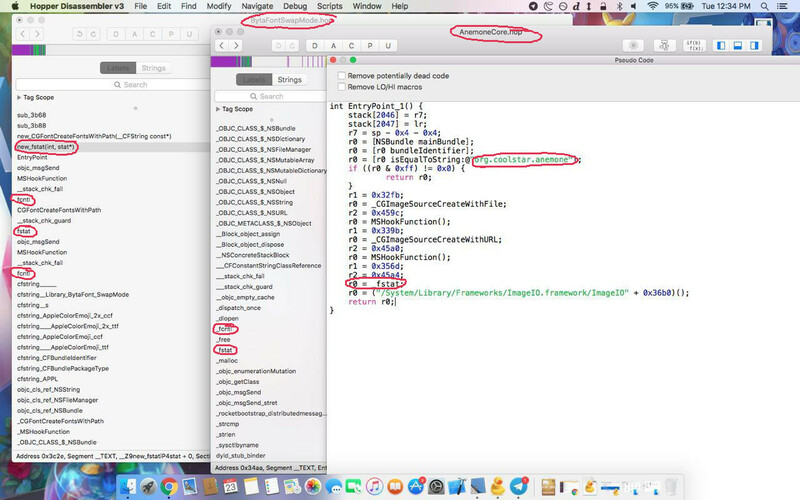 According to an update on this specific article, Coolstar (Dev of Anemone) claimed that “Bytafont tried to copy his code” but messed up. This might explain the incident. I can say exactly why this happened. Shortly after I pushed out the Anemone update that added Font support, Bytafont copied the hook I used. Seeing this, when I added emoji support to Anemone Fonts, I obfuscated the code that did the emoji support. Bytafont nontheless still tried to copy it. However, this time… they screwed up copying the code badly! Despite all the arguments about what happened, there is a fix to this issue. BytaFont tweak just got updated to version 3.1.3, shortly after the discussion was opened. I quickly grab the update and can confirm that it works. So, if the tweak keeps crashing on your jailbroken device, go to Cydia and update it. Although this resolved the issue, it seems like a rollback rather than an actual update. Update #1: Crashing was a minor problem, bootloop is the main focus of this post.